Here together are my first six Evil Warriors for my MotU project: Skeletor, Beast Man, Mer-Man, Hordak (Spirit) and two Shadow Beasts. I have written a set of rules for Masters of the Universe gaming, and in those characters are rated in value in terms of Power - this group is neatly 400 Power. Skeletor is the most powerful, with magic and abilities representing his dark lord aspects. Mer-Man, Beast Man and the Shadow Beasts are the muscle of the Band. Finally, Hordak (in his spirit form) acts a buffer to the Leader (Skeletor), and has some magic at his disposal, but he cannot resolve objectives or count as a scoring unit. I have started work on Trap Jaw too, but I really need to add some more Heroic Warriors to get enough models to field two bands to face each other. 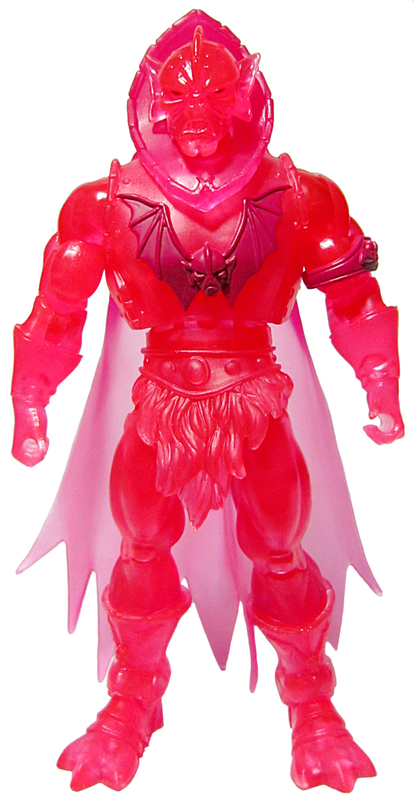 While scanning various bit of canon and background information on Masters of the Universe, I came across a Hordak action figure (which you can see below the painted mini pics) representing him in spirit form when he corrupts Keldor to eventually become Skeletor. This is before Hordak consolidates his power on Etheria or invades Eternia, having been banished from Eternia long in the past. Now before you have doubts, I promise I don't collect action figures these days - I am a proper grown up who plays with toy soldiers! Pew-pew! I managed to snag a couple of different interpretations of Hordak from private commissions, and was able to get more than one copy of this one. When I found out about the Hordak in spirit form, my mental cog (just the one!) slowly started turning, and found a use for the extra copy of the mini. The painting for this Hordak was a process I don't normally use - essentially mostly glazes and washes. I looked up some processes used by other hobbyists for painting their LotR Army of the Dead minis. The mini was undercoated with my usual grey primer, with additional priming in white from directly overhead. I then used 4 or 5 various red washes, choosing different shades for different areas of the mini, as well as a little Ogryn Flesh and some Tamiya Clear Red. There was some regular painting involved, but mostly the mini was coloured with washes and glazes. The overall effect is certainly a little more pink overall than I envisaged or wanted when I thought about using washes/glazes, but nonetheless I think I am generally happy with how it turned out. I am not sure what i would really do differently and won't likely be revisiting it now. 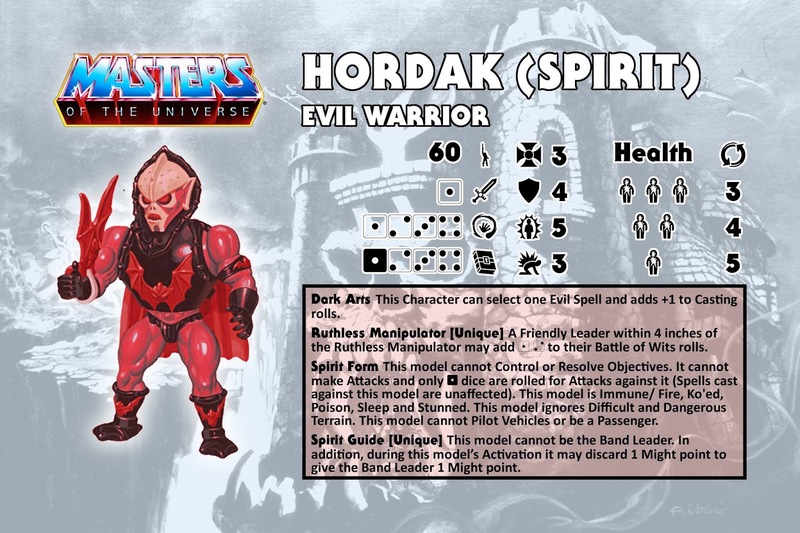 In building rules to represent this form of Hordak, I found it took a few attempts to get right what should essentially be a 'spirit adviser' Consequently, in this form Hordak is counted as an Evil Warrior instead of a member of the Evil Horde since he is manipulating Skeletor to free him from the dimension of Despondos. These Shadow Beasts are part of a private commission from which I was really fortunate enough to be able to get copies, and I am very glad that I did. They were nice and simple to paint, just the kind of welcome diversion from my recent painting block. They also mean that I can tick off a couple more minis for my MotU Project. 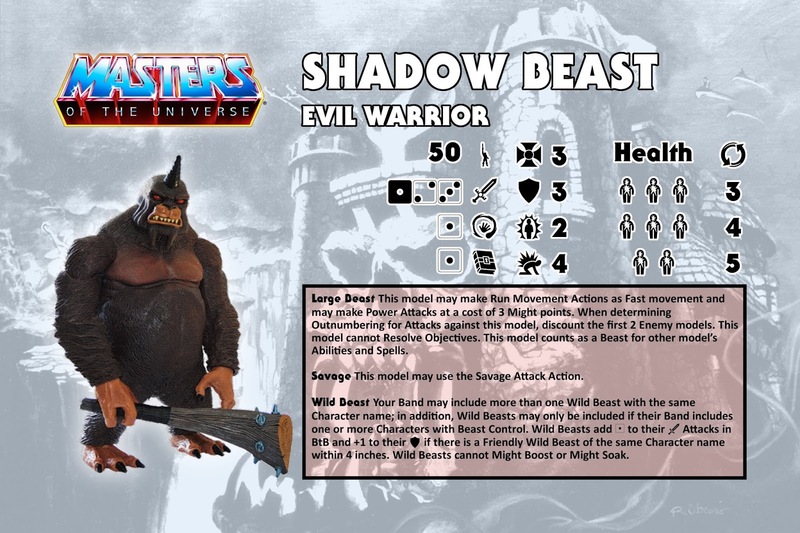 The Shadow Beasts were featured in the original He-Man and the Masters of the Universe cartoon, as well the 2002 cartoon of the same name. They are large ape-like beasts living throughout the dark hemisphere. With their great strength and stealthy appearance, Shadow Beasts are described as more than a match for most heroic warriors. The painting was done in a few hours, but broken into smaller chunks of time, so in reality maybe 2 to 3 hours in total. They were mainly dry-brushed with some washes here and there, and highlights added to hands and feet. It was nice to have a couple of minis done so quickly. the colour scheme was mainly influenced by the Masters of the Universe Classics version action figure from recent years. 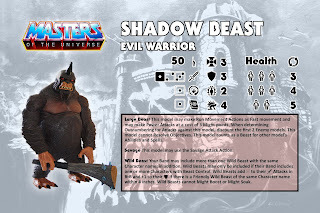 I had originally intended to use Shadow Beasts and other creatures as 'wandering monster' types in MotU games, but subsequently decided that they would be best used as an option to be used alongside Beast Man so I adjusted my plans for them accordingly. Now they can only used if Beast Man (or another Beast Controller character) is in the same Band, which feels right to me. It feels good to get something finished, even simple stuff like these Treasure Chest Markers and another Mimic. They were started in December to try and get myself out of the rut that marked much of my 2018 hobby output, but they never got finished in that month as planned, so with a bit of time spare i decided to crack on with them. I finished the metal-work on the last Treasure Chest this week which meant I could finally finish the basing on all of them collectively and get them cleared from my backlog. The Mimic is from a Krakon Games Kickstarter (not sure if is on their store yet), and is my second Mimic (after this one from Reaper Bones). I intend to eventually use it with my other Mimic and the Treasure Chest Markers in either some 28 mm dungeon-based Fantasy Gaming or Chibi Fantasy gaming. Mer-Man was always one of my favourite Masters of the Universe characters when I was a young kid, and I am pleased to have painted him up for tabletop gaming as a much older kid! 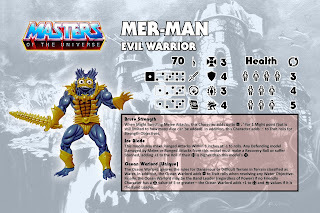 Ruler of the undersea realms of Eternia, Mer-Man was forced to serve in the armies of Skeletor after his kingdom was destroyed in a battle with rival ocean clans. His allegiance with Skeletor brings him to the surface world more often then he would like. Lurking deep beneath the Sea of Rakash, Mer-Man awaits the evil call to arms of Skeletor! The miniature is from Quest Miniatures, from their second wave; it is a lot nicer sculpt than then last one I painted (Moss Man from wave 3), and therefore a more enjoyable painting experience - the sculptor of this and the other wave 1 and 2 minis is Boris Woloszyn and I love his evocation of a MotU style, and think his approach is a wonderful fit to the genre (I suspect design choices of weapons were down to Quest Miniatures rather than the sculptor). The only change i made was replacing the spear haft with brass rod. Finishing Mer-Man brings me to three painted Evil Warriors so far, along with Skeletor and Beast Man. Hopefully I can get a couple more Evil Warriors done soon before turning my attention back to the Heroic Warriors. 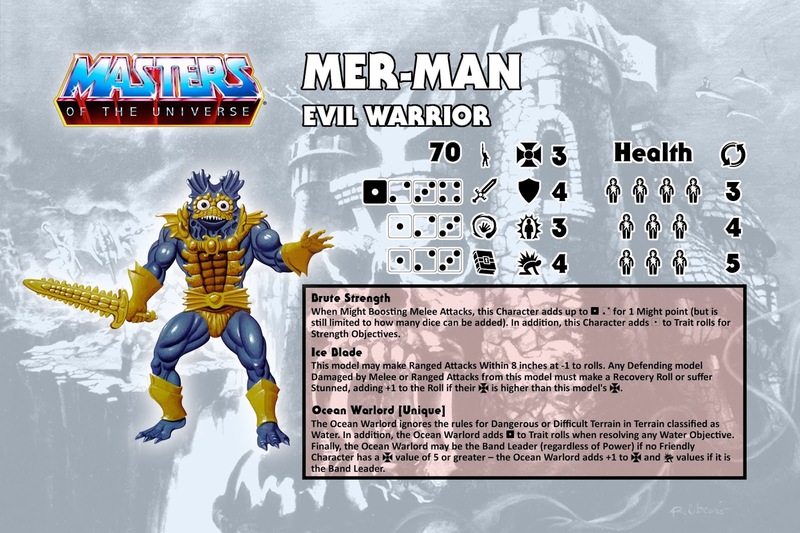 Although Mer-Man is often portrayed as somewhat cowardly he also has a history of being an Ocean Warlord, which I have tried to reflect in the rules I did for my personal MotU skirmish game. I need a few more painted up to get started with gaming so it is certainly time to motivate myself. 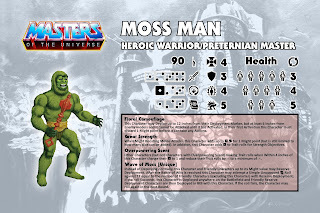 Moss Man is the latest in my very sporadic Masters of the Universe (MotU) Project. With much of 2018 focused on developing my own range of minis, painting took something of back seat to those preparations. I wanted an easy win to get my 2019 painting started (a month late no less! ), so this sculpt of Moss Man from Quest Miniatures fit that bill. Unfortunately Moss Man is not sculpted by the same person who did the first dozen or so MotU minis from Quest, so it looks a little static in comparison as well as having a different sculpting style. In addition, it is possibly half a head short compared to the rest of the line, and I wish it had the action figure's mace. Nonetheless, tackling Moss Man made for a quick paint job all told as I went for something basic, with some washes, dry-brushing and picked out highlights, and that means I can tick another off the 'to be painted' list. With my current painting being so sporadic I am not committing to a He-Month like last year as I dismally failed to meet my own expectations; instead I will paint more MotU-related minis as I get the motivation. 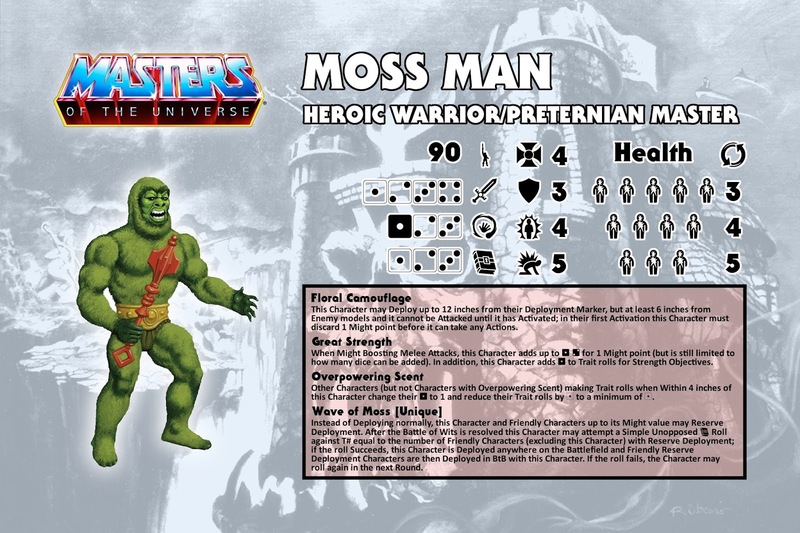 Moss Man is an ancient good of nature in MotU lore, so I have tried to reflect that in the rules I have written for my personal rules set. To find out more about the rules, or other fan-made creations, feel free to look me up on Facebook. The Gerbil Fighter from the Tooth & Sword range is the first Chibi Fantasy mini I have painted in a little over a year, and it made a nice change of pace from trying to get the Kitbash Games stuff ready for launch (enjoyable though that is - it creates its own pressure), and more importantly clears a part-painted mini from the dreaded painting queue! In the past week or so I have been tinkering with some rules ideas for fantasy dungeon-bash skirmish game character progression, and that in turn motivated me to finish the Gerbil Fighter. This marks the twentieth mini for my Chibi Fantasy selection (two Adventurers and eighteen Monsters); the total number surprised me when I looked in the figure cabinet - more than I would have estimated. I would like to get at least four more minis painted this month to at least exceed my second-worst annual painting total (24 in 2012, better than an estimated 18 in 2009); to that end I have a few other fantasy bits and bobs I may try and tackle such as Treasure Chests and another Mimic, and maybe another Adventurer.